Kids and fans alike can imagine the biggest battles and missions in the Star Wars saga with figures from Star Wars The Black Series! With exquisite features and decoration, this series embodies the quality and realism that Star Wars devotees love. The First Order can only operate effectively with the absolute loyalty of its followers. Should any soldier be found guilty of treason, it is up to the special branch of Stormtrooper to dispense final justice. 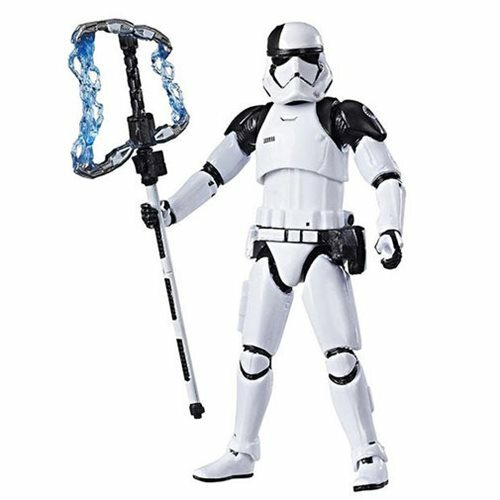 Kids and adults alike can re-create the exciting stories of good versus evil in a galaxy far, far away with this formerly exclusive 3 3/4-inch First Order Stormtrooper Executioner action figure from Star Wars The Black Series.